Be like all the cool kids and start popping farm-to-table popcorn. Check your local farmers’ market and inquire about popcorn kernels. I purchased a pint container of colorful kernels from Samascott Orchard at the Union Square greenmarket a few months ago. Unfortunately, red and blue kernels do not yield red and blue popcorn. They all pop white. Still good. 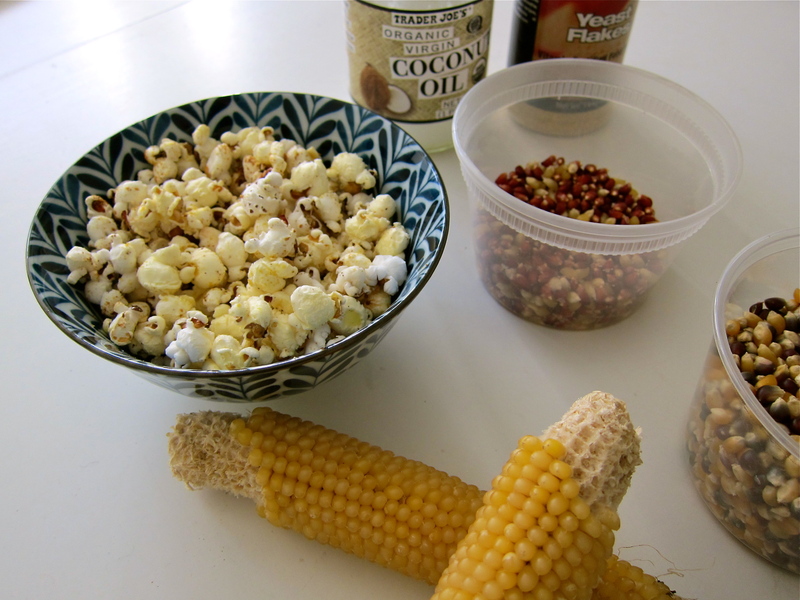 I received popcorn kernels on the cob in my Corbin Hill Farm Share box! Amazing. I know there are all sorts of great recipes where once can pop the corn right on the cob, but alas, I needed something to do with my hands while I watched TV one night, so I started to pick the kernels off the cob and put them into a container. 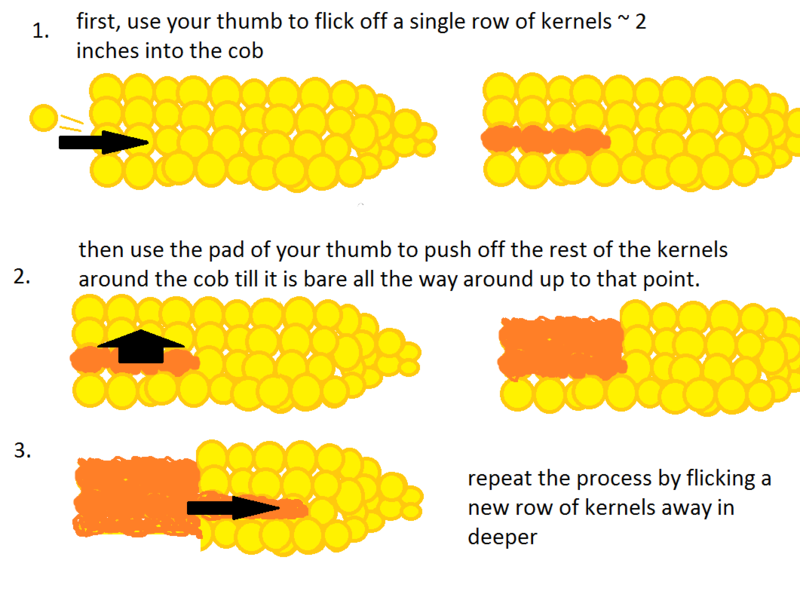 After my boyfriend noticed me struggling, he took a stab at de-kerneling and discovered a foolproof method for getting the feisty kernels off the cob. Oh, and then he made a diagram so that we can all follow his scientific method. To learn more about Corbin Hill’s popcorn, check out their blog post about it here. What are some of your favorite healthy popcorn toppings? Heat the coconut oil in a large pot. Let it melt. Add a few test kernels, cover the pot, and let them pop. Once the test kernels pop, add the full 1/2 cup of kernels. Cover the pot and let the kernels pop, shaking the pan continuously until the popping sounds subside. Turn the heat off and continue to shake the pot a bit more. Pour the popcorn into a bowl and add salt and nutritional yeast. Enjoy! I just found this site and it is GREAT! Was searching for a carrot ‘bread’ recipe to make with my awesome big ‘juicing carrots’ (since I totally ruined my original intention to make carrot soup with them by drinking actual carrot juice today….and it led me here. I’m super-impressed with your blog on a lot of levels- having 3 dogs in the family is just for starters, I’m a big-time PET PERSON, too, and also had an ‘ex-dog’, who horribly enough decided mere WINDOWS COULDN”T HOLD HIM BACK! Serious Separation Anxiety- and the fact that you went back from working to grad school- in NEW YORK CITY from SanFran! Fantastic~ I will definitely be following this blog! Yes, I am a Foodie: I live in Cleveland, though I’m a New Yawker by birth, love to mess around in the kitchen, though I’m usually just feeding ME: total vegetarian, a closet music critic and journal-er, and though I don’t blog, some of my e-mail correspondences definitely work on that level too. So here (finally!) are the TWO THINGS I want to say: I have just recently gotten ‘into’ making stove-top-popped popcorn as a girl’s night in’ (the girls are usually just me and my sweet lab mix Josie ) treat to accompany a little white wine, watching videos on a Saturday night: it’s a total delight. I cannot wait to try your suggestion for coconut oil and nutri-yeast–woo hoo! Second– do you by any chance live in Greenwich Village, like around Bleeker and that area? if by some strange co-incidence you do,,Have you ever been to Vivaldi’s cafe-if it’s still around? They used to be a coffee house, though think they might have transformed into a real restaurant now, and had awesome Viennese pastry– like Linzer tortes- and excellent coffee plus LIVE MUSIC, often CLASSICAL, all week! Second thing: since you’re a major fig fan do you know about those incredible healthy fig- and-fruit bars that are out on the market? “Nature’s Bakery” makes them. They are super delish but actually seem to involve multiple kinds of sweeteners (cane syrup AND brown rice syrup AND,,,!! Maybe you can come up with ‘lower glycemic’ copycat recipe for them sometimes…. Anyway, really dig your recipes and your writing. Hi Nina, so wonderful to hear from you. Thanks for dropping a note! Any leftover carrot “mulch” after making juice would be perfect for carrot bread. Great idea. Yes, I have been to Vivaldi to hear a friend play music. It’s a sweet little spot. I will have to go back and try the pastries there. Keep in touch!